Special Fathom Feature: Enjoy a specially produced introduction from Turner Classic Movies that will give insight into William Wyler’s classic. 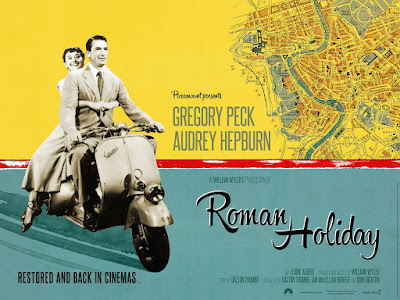 Fathom Events, Turner Classic Movies and Paramount Pictures are delighted to bring the 1953 American romantic-comedy classic, Roman Holiday, back to the big screen in cinemas nationwide on Sunday, November 29. Starring Gregory Peck and Audrey Hepburn and directed by William Wyler, Roman Holiday won three Academy Awards® for Best Actress in a Leading Role, Best Costume Design and Best Writing. In this timeless classic, Hepburn is at her transcendent best as a sheltered princess who falls for an American newsman in Rome. The purchase tickets in advance click here. Run Time: 2 hours and 15 minutes (approximate). Let's try to meet at 1:45 p.m. by the concessions, theater level.